New York, NY, February 19, 2010 /PN/ Mosaic Legends, LLC, one of the world’s premier digital media companies focused on turning digital assets into marketable consumer products and services, recently launched a partnership with NBC Universal, delivering classic Winter Olympic photomosaics made up of thousands of photos from past and current Winter Olympic events. Presented by Toyota, the applications are available at www.nbcolympics.com/photos/mosaics.html. Mosaic Legends has combined the mosaic concept with the amazing ability to animate zooming in and focus on each tile photo so that fans can literally view thousands of images and accompanying text. 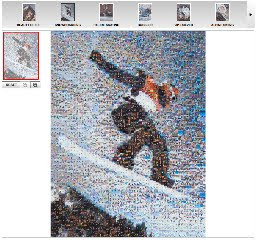 The first nine mosaics are made from 1,173 images that were created from high definition video of past Olympic Games. The final three mosaics will be produced using content from the Vancouver Games over the next two weeks. Mosaic Legends' digital publishing platform simplifies the App building process and allows content creators to easily enter photographs, text, audio and video through its web-based interface. This turnkey solution gives Mosaic Legends the ability to bring new products to market in a relatively short period of time. This is the first formal push for the company into the sports arena after several years of success with musical artists such as David Bowie and The Grateful Dead and other iconic properties like The American Museum of Natural History. The company will also be launching a Muhammad Ali App in the coming weeks, with more sports-specific projects planned for later this year. Founded in 2005, Mosaic Legends (www.mosaiclegends.com) is one of the world’s premier digital media companies focused on turning digital assets into marketable consumer products and services. Leveraging its interactive Photomosaic® technology, the company enables content creators to utilize their multimedia assets and engage their audience across mobile, web and print applications.